This article was reported in partnership with the Investigative Fund of the Nation Institute, with support from the Marguerite Casey Foundation’s Equal Voice Journalism Scholarship. At around midnight on November 13, Tonya Martin slipped out into the yard that separated her trailer from the one in which her grandparents live on a lot in the eastern hills of Tennessee. Just two months earlier, the Monroe County Sheriff’s Department arrested Martin after she gave birth to a son. Her crime: delivering a child at Sweetwater Hospital with drugs—some kind of opioid—in his system. 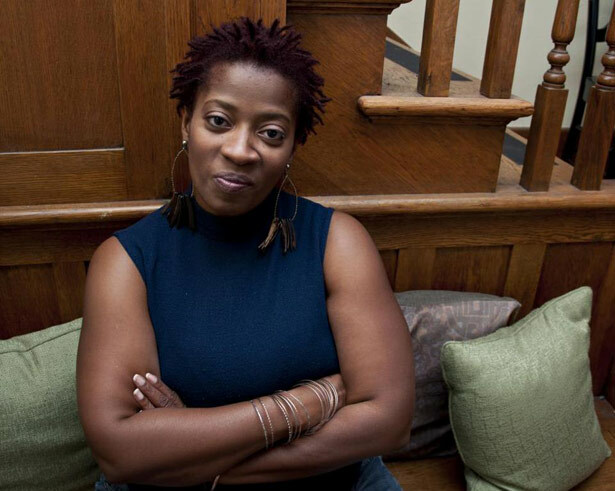 Martin couldn’t shake her addiction or the depression that plagued her. The 34-year-old mother gave up the newborn for adoption. Not long after, Martin’s boyfriend found her dangling from the clothesline pole in her grandmother’s yard. He tried to resuscitate her, but it was too late. Martin didn’t leave a note. “That’s kind of the way the troubles of life choked her,” said her cousin, the Rev. Vernon Webb, 66, who led the funeral service in Tellico Plains, Tennessee. Webb said that 150 people came to Martin’s funeral in the poor, tiny rural town (population: 894). Ten years earlier, she had given birth to a stillborn boy, Xavier, and the anniversary was approaching. “That kind of burned down on her mind,” Webb said. Many states have laws about parental drug use, and government agencies are responsible for protecting children from parents who are neglectful or abusive. But Tennessee’s law, passed in April, is different: it handcuffs new mothers upon delivery. The new law amends a Tennessee criminal-code section so that women may be charged with assault for illegal behavior while pregnant. It threatens up to fifteen years in prison “for the illegal use of a narcotic drug…while pregnant.” Prosecutors say that a woman’s enrollment in drug treatment could serve as a defense in court—but, in a cruel Catch-22, drug-addicted poor women often can’t get treatment, even when they desperately want it. The law is not only incarcerating a handful of new mothers but affecting many more women, as evidenced by months of interviews with women, doctors and health workers. Pregnant women are diving underground in an effort to avoid the fate they’ve seen in mug shots on the local news. They are avoiding prenatal care—and when they do get it, they are switching hospitals at the last minute, leaving the state, or giving birth outside of hospitals in the hope of avoiding prosecution and keeping their children. Tennessee’s maintenance-treatment options for poor women were already scarce, so women who want help are finding little, if any, help. Some are detoxing alone, against the strong recommendations of doctors. Even when women try to get treatment, the state is still taking their children. Three weeks before Martin committed suicide, on the side of a road an hour’s drive away, Brittany Nicole Hudson gave birth in a car. 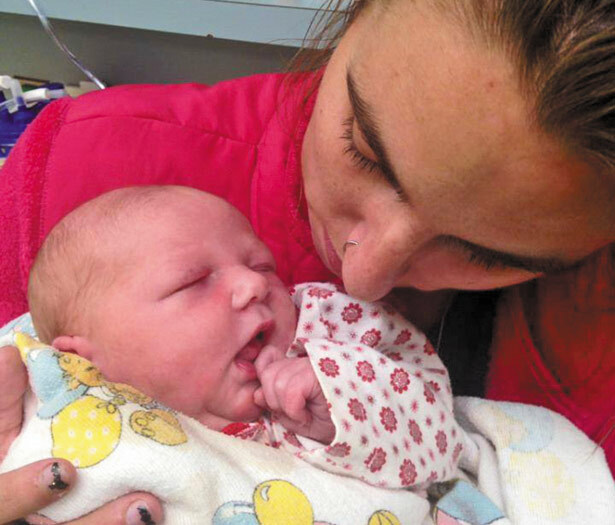 A friend delivered the baby girl, who later tested positive for drugs. Fearing the law, Hudson, a 24-year-old with straight brown hair and black square glasses, didn’t take her baby to the hospital. “You know you can be a good mom if you can get clean,” she added, “but you can’t do it alone.” In November, she was charged with assault, and her mug shot appeared in the news. Brian Holmgren, a Davidson County prosecutor devoted to child-welfare cases, said the reason Tennessee passed the law is simple. “Drug users are not good parents,” he told Alcoholism & Drug Abuse Weekly. The law was the brainchild of the Tennessee District Attorneys General Conference. Shelby County District Attorney Amy Weirich, a Republican, led the charge in Memphis. The prosecutors said they needed stronger penalties to control addicted women’s behavior. They had tried ordering birth control as a condition of probation in Rutherford County, and giving out long-acting contraception in jails. They wanted a tougher approach than that embodied by a 2013 law, the Safe Harbor Act, meant to address neonatal abstinence syndrome (NAS), the medical name for babies born in a state of withdrawal. Brittany Nicole Hudson gave birth in a car at the side of a road because she was afraid she’d be arrested if she went to the hospital. She was later arrested anyway. When SB 1391 was up for debate, women’s-health advocates raised fears about the dearth of treatment options, even though the state has seen an increase in opioid use over the last decade. But prosecutors waved such concerns away. “I wouldn’t want one detail to get in the way of what this bill would do,” Sullivan County prosecutor Barry Staubus testified. When asked what prosecutors would do if a woman had been denied drug treatment, Weirich did not have an answer. “It’s hard to answer a hypothetical like that,” she said. But TennCare has one of the most restrictive eligibility and enrollment processes in the nation, advocates say. Wolf could not be enrolled because she didn’t have custody of her first child, Brooks said. Seven months pregnant, Wolf tried to detox herself at home, screaming in pain. It was too hard and too dangerous. She tried going to a methadone clinic, but said the doses weren’t high enough. Through a local ministry, she signed up for Mississippi’s Medicaid program and got admitted to a hospital, which put her on maintenance treatment. Three weeks later, on April 25, she gave birth to a boy she named Torrion, five pounds, eleven ounces. Wolf gave birth via Caesarean section, and as she awoke, a worker for Mississippi Children’s Home Services told her that the state would take Torrion because she had drugs in her system when she arrived at the hospital, according to Wolf. She pleaded with the worker, explaining she had tried for months to get help in Tennessee, and that if she had stopped cold turkey she could have miscarried. Wolf relapsed soon after, her mother said. By August, she had overdosed twice. Brooks wouldn’t take her eyes off her daughter, fearful that the next time would kill her. When a newborn is found to have drugs in its system in Tennessee now, the doctor reports the case to the hospital social worker. The social worker reports it to the Department of Children’s Services, and the DCS, in turn, reports it to the sheriff, who can arrest the woman directly. Opening the door of her boyfriend’s pickup near the methadone clinic in Memphis, a woman named Megan revealed that her baby, born a month earlier, was still in the hospital. “DCS is trying to take my baby and my other kids,” she said, sounding both defeated and determined. Megan had brought paperwork to the hospital showing she was receiving doctor-ordered methadone. She was reported anyway, as per protocol, though not arrested—an indication of the discretion at play in enforcing the law. Her boyfriend looked at her with agitation; he needed to get going to his construction job. “They want to take all my kids,” Megan said as the truck pulled away. 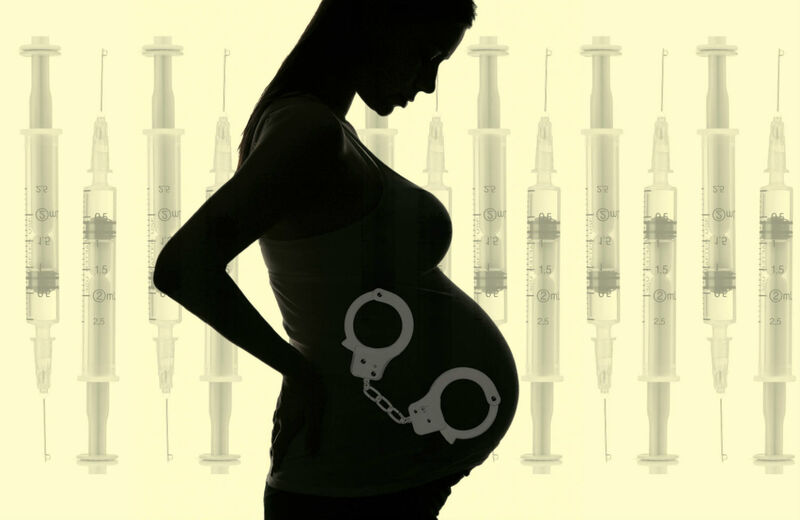 The nine women arrested under the law are a fraction of the number who have given birth to babies with drugs in their system in Tennessee. There have been at least 874 NAS births in Tennessee this year, according to the state’s Department of Health. The women arrested represent some of the state’s poorest areas, and all but one used a public defender. Memphis accounted for about 4 percent of the cases in the state, but two-thirds of the women arrested under the new law. Doctors told Falls that pregnant women who use opioids—prescription painkillers like oxycodone and its sister, street heroin—shouldn’t stop once they’re pregnant. Instead, they should use opioid-replacement drugs rather than detox completely and shock a fetus with withdrawal. But the residential treatment centers in Memphis were detox facilities with no replacement therapy allowed, so Falls was on her own. Judge Tim Dwyer, who presides over the fate of hundreds of Memphis’s addicted, has put a sort of informal stay on Falls’s case. She must follow his recovery regime for eighteen months, her attorney said. She attended a monthlong rehab program and now must live in a halfway house and attend four meetings a week, two at the drug court and two in a twelve-step program. Dwyer said that, barring a relapse or a refusal to comply, he would drop Falls’s assault charge when the year is up. What’s more, pregnant women who use drugs in Tennessee are on a collision course with the now-dominant strain of the drug-treatment world there, which opposes the medication-assisted approach favored by doctors—an approach that is especially essential during pregnancy, when going cold turkey can have grave consequences for the fetus. The twelve-step tradition is abstinence-only, banning the use of methadone or Suboxone, even as studies established these medications as the gold standard for opioid-dependence treatment. Treatment is also expensive, putting it out of reach for many. Tennessee’s Medicaid program, TennCare, generally does not cover methadone treatment. Outside the methadone clinic in Memphis, people line up on the grass at 5 every morning, some driving from hours away to pay $98 a week out of pocket. A few trucks stall in the parking lot, windshields fogged over, while the passengers go in for their daily cup before work. One woman in pajamas said the clinic let her accrue a balance while she was pregnant, which she was still paying off. When it comes to methadone, Judge Dwyer is not a believer. He doesn’t allow medication-assisted treatment for participants in his drug-court program, instead mandating twelve-step meetings. “I think that Suboxone is like substituting one drug for another,” he said. Dr. Finnegan is not optimistic about court-ordered drug treatment without the option of medication assistance. “Good luck if you’ve got a woman who comes in who has been using drugs for a decade. This is not a way to treat a medical condition,” she said. Lynn Paltrow, executive director of National Advocates for Pregnant Women, shares that view. “The legislature of Tennessee is the first to explicitly declare that their criminal laws may be used to arrest, prosecute and lock up women in relationship to their own pregnancies,” Paltrow said. She noted that the law came in the wake of efforts, in Tennessee and other states, to criminalize assaults on fetuses by other people, which grew out of the anti-abortion movement’s “fetal personhood” campaign. But she points out that the Tennessee law has other implications, too: the state altered its criminal code to leave women subject to assault charges if they commit any unlawful act or “omission” while pregnant. “It is anyone’s guess what police and prosecutors will consider unlawful acts or omissions,” Paltrow said. In November, a pregnant woman in Greene County, Tennessee, was charged with reckless endangerment under the new law for driving without a seat belt and fleeing the police. Paltrow expects that prosecutors may also go after women for delaying surgery, failing to follow a doctor’s advice for bed rest during pregnancy, or choosing a home birth with a midwife. But it’s not just a Republican effort. The Democratic Party ruled the Tennessee legislature from Reconstruction until the 2008 election. By 2013, the Republican Party had supermajorities in both chambers of the legislature and controlled the executive branch of state government. Yet support for SB 1391 was bipartisan: Reginald Tate, an African-American Democrat from Memphis, sponsored it. The anti-abortion forces had quashed a similar bill before, and women’s-health advocates and the local American Civil Liberties Union assumed they’d do it again. But the state health department and the Tennessee Medical Association were working behind closed doors to fashion some compromises. They managed to get the felony charge written out of the bill so that it specified only assault. If a woman is in drug treatment, the law gives her an affirmative defense, meaning that she can still be arrested but now has a defense in court. In this form, the law passed in the House by a vote of sixty-four to thirty. After passage of the law, which received extensive media attention, doctors noticed changes in their pregnant patients’ behavior. From Nashville to Appalachia, women who use drugs are avoiding prenatal care. In Nashville, three pregnant drug users told their friend Katie Cunningham, a former drug user, that they were scared to see a doctor. One went to Alabama to give birth. Another disappeared in September, according to Cunningham: “Her family tried to get her help, but she was too scared.” Around her due date, the woman, named Mack, seemed to vanish. Her friend can’t help believing the worst. Rosa GoldensohnRosa Goldensohn is a reporter in New York City who studies at CUNY’s Graduate School of Journalism. Rachael LevyRachael Levy is a reporter in New York City who studies at CUNY’s Graduate School of Journalism.